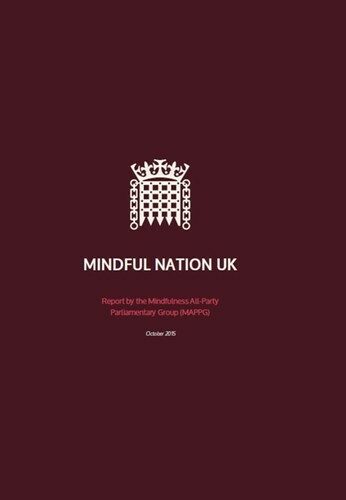 In October 2015, Mindful Nation UK―a milestone policy document seeking to address mental health concerns at a national level through the application of mindfulness-based interventions (MBIs)―was submitted to Britain’s Parliament by the Mindfulness All-Party Parliamentary Group (MAPPG). 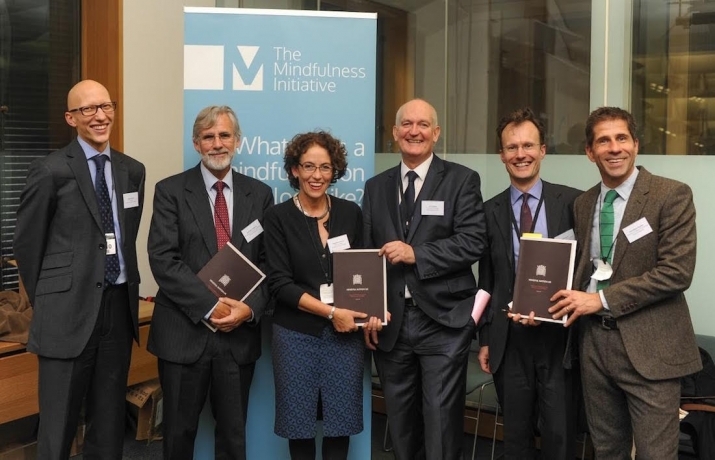 Consisting of elected members of parliament and members of the House of Lords representing the Conservative, Labour, and Liberal Democrat parties, the MAPPG submitted the report to Parliament with three objectives: to review scientific evidence and best practices in the field, to develop policy recommendations based on those findings, and to act as a forum for parliamentary discussion about the role of mindfulness* and public policy implementation. The final recommendations were made in four broad fields: health, education, the workplace, and the criminal justice system. Although these are just recommendations and there are no expectations that they would be taken on wholesale as policy, the potential ramifications of the report are nonetheless significant. If the British government acts on a sufficient number of the paper’s recommendations (and some are already being considered and enacted), it should set a positive precedent for the mindfulness paradigm to be applied across the public sector beyond the four fields so far researched. Among the substantive and specific points addressed, the following examples stand out. For the criminal justice system, the report urges that the National Health Service (NHS) and the National Offender Management Service “ensure the urgent implementation of NICE’s [the National Institute for Health and Care Excellence] recommended Mindfulness-Based Cognitive Therapy (MBCT) for recurrent depression within offender populations” (p. 8). In the professional sphere, Mindful Nation UKrecommends that the Department for Business, Innovation and Skills work with employers to “promote the use of mindfulness and develop an understanding of good practice” (p. 8), while in health, “MBCT (Mindfulness-Based Cognitive Therapy) should be commissioned in the NHS in line with NICE guidelines so that it is available to the 580,000 adults each year who will be at risk of recurrent depression” (p. 7). I recently had an opportunity to speak with Dr. Rebecca Crane, one of the researchers on the final chapter of the report, “The implementation challenge.” A member of The Mindfulness Initiative’s advisory group, the organization that provided the secretariat to the MAPPG, Dr. Crane was speaking at the 2nd Conference on Mindfulness at Sapienza University, Rome, from 11�C15 May. Her first exposure to meditation practice and Buddhism came early: “I was fascinated by the Asian understanding of the world after I spent six months with a lay community in Thailand after graduating from university,” she said. As a student in 1994, she met Mark Williams, now emeritus professor of Clinical Psychology at the University of Oxford, under whom she studied and who helped fund her with resources from the university while she attended a Mindfulness-Based Stress Reduction (MBSR) internship in the United States. In 2002, she became an occupational therapist and integrative counselor. At present, Dr. Crane directs the Centre for Mindfulness Research and Practice at Bangor University in North Wales. All this is aimed and appropriated for the benefit and standing of the institution.” Currently, much of the evidence around MBIs centers on personal testimonials, self-reported outcomes, and implied correlations between the intervention (the mindfulness activity) and the result. The lack of definitive evidence and a refined methodology, along with the fact that evidence-gathering for MBIs is a new discipline for a new field of enquiry, clashes with the expectations of mainstream institutions. They question whether it’s a waste of time and how effective it really is when there is so much work to do and people to take care of already. And again, they want quick and easy evidence to show whether it is effective,” she said. Despite these unresolved issues, continuously improving models for measuring the benefits of mindfulness help Dr. Crane remain optimistic that more nuanced questions will soon be answered satisfactorily―such as which approaches work for whom and in what context, and the different effects of a traditional eight-week MBSR/MBCT model, low-dose delivery (in terms of mindfulness meditation sessions, or models shorter than eight weeks) and another mode of treatment. The next step is setting up standards of quality control and governance to weed out unethical, unscrupulous, or incompetent mindfulness instructors. The report notes that the UK Network for Mindfulness-Based Teacher Training Organisations represents 16 mindfulness teacher-training institutes, despite governance and regulation structures being relatively undeveloped. An international association of teacher-training organizations is being established, and the UK Network is working with British charitable organization the Mental Health Foundation to compile a central list of mindfulness teachers in the UK that meet the minimum training standards, hopefully leading to a professional register of mindfulness teachers. Bangor, Exeter, and Oxford host the three main university-based training centers (p. 65). * Most of the academic research and evidence on mindfulness has been drawn from the eight-week Mindfulness-Based Stress Reduction (MBSR) or Mindfulness-Based Cognitive Therapy (MBCT) model and their spin-offs.